IT MAY BE because I am getting older. After all, these ever-spreading gray patches in my beard are a sure sign that I am no longer twenty-five. It may be that with the gray comes a little hard-won knowledge. Having made most of the mistakes that a blundering big-game hunter can make in his early years, I am surprised to find myself actually reflecting upon some of them and managing to avoid repeating a small but encouraging number. So while at forty-one, I am certainly not a candidate for an old-folks' home, the passage of time has lead to an evolution in my hunting. One of these changes is in my approach to western big-game hunting. Having unwittingly spooked innumerable elk, deer, and God knows how many other animals out of such places as Colorado's black timber, Montana's high-desert sagebrush, Kodiak Island's alders, and South Africa's bushveldt over the years, I no longer feel the need to grab my gun, walk headlong into the thickest patch of weeds in the county, and kill something "the hard way." Oh, I like still-hunting ?and particularly tracking ?as much as the next guy, but the truth is that I could flush a pig out of a luau without half trying. For me, anyway, wading into the thick stuff may be heroic, but it is hardly the most productive way to hunt big game, at least out West. 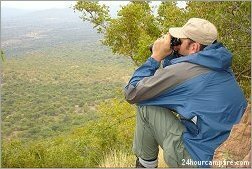 When the terrain allows, I am more than content to spend most of the day sitting comfortably behind a good binocular. A binocular allows me to cover much more country than I can cover on the hoof, without needlessly spooking game. Planning and executing a stalk on an already located and selected big-game animal has proved to be both fruitful and uniquely satisfying. I like to think of it as hunting "the smart way." Being a Jack O'Connor fan, I had the great fortune of actually taking his advice relatively early in my big-game-hunting career, back when I knew it all. I selected a high-end 7x42 as my first "big time" hunting purchase. In the twenty-plus years since, I have benefited from that selection more and more as my hunting strategies have evolved. That binocular remains a treasured and well traveled old friend. Much later, after a Kodiak Island bear hunt made it obvious that my partners' 10x optics outgunned my 7x during long-range glassing sessions from a boat, I surrendered to the allure of higher magnification, saved my nickels, and bought a 10x42 binocular. My new 10x42 is top-shelf glass, and I appreciate the benefits of increased magnification and twenty-odd years of advances in optics technology as much as the next guy, but the new 10x does have some drawbacks. The laws of physics, after all, are irrefutable. The most obvious downside of the 10x for me is my inability to glass for any long time without a very firm rest. Even sitting comfortably with my elbows braced on my knees, during hours-long glassing sessions I find myself tiring and fighting to stay focused. Other hunters have less trouble with this, but other hunters do not do my glassing for me. Certainly smaller field of view, decreased light transmission, and degraded resolution can become notable issues when higher magnification comes without a matching increase in objective-lens diameter, but for me, the shakes remain the big downside to increased magnification. Bottom line: 10x binoculars are much more difficult than 7x for me to use hand-held. At 10x, I thought that I had reached my limit. 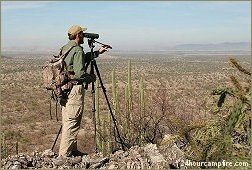 I had heard of the small clique of Coues deer hunters in Arizona, New Mexico, and Sonora who used specialized high-magnification binoculars mounted on tripods to glass far and wide for those wee whitetails of the southwest mountains. 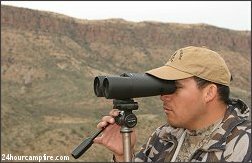 Without any firsthand knowledge of them, I foolishly dismissed those "Big Eyes" binoculars as suitable only for Coues deer or practical only in that particular southwestern terrain, and certainly not appropriate for a guy who was looking to lighten his load, not to add hulking glass and bulky tripods to his kit. All it took for me to see the light was an archery hunt for Coues deer in Arizona with Enrique Ramirez of Enrique's Trophy Hunts. I had my high-end European 10x42 binocular and a 20-60x85 spotter of superb quality. My hunting partner, Major Blaine Painter, an Air Force pilot, also had a 10x50 binocular and a 32x77 spotter of another top-shelf European brand. Both Major Painter and I have well over twenty years of experience hunting big game and have a notion or two about what constitutes good hunters' optics. We both came prepared with good equipment that we had successfully used before. And we both agreed that with top-end binoculars and spotters already in hand and paid for, we were done buying glass! Guess what? From the word go, Ramirez, all of twenty-two years old and using a mid-grade 15x60 binocular on a light aluminum tripod, ran circles around us. He consistently found animals first, saw animals with his setup that Major Painter and I could not find (often even with his help), and covered country more quickly, thoroughly, and efficiently alone than we did together. It was no contest. Later that trip, after a pleasant afternoon visit with Duwane Adams, noted Arizona big-game guide and Big Eyes pioneer, in which Big Eyes glassing technique was the topic of conversation, both Major Painter and I "arranged" to have our 10x binoculars mounted on tripods, where they remained for the rest of the hunt. I discovered another phenomenon ?10x binoculars on tripods do not suffer from the shakes! And even 10x binoculars are eminently more useful when they are mounted on a tripod. I glassed more productively and more efficiently (and more comfortably) that afternoon than I had been able to do at any other time in my hunting career. The difference was that great and noticeable. From that day on, if there was any way for me to glass from a tripod, I did it that way! Count me firmly in the tripod-converted camp. A later Sonora mule-deer hunt with Ramirez and a recent New Mexico antelope hunt with Kirk Kelso and Pusch Ridge Outfitters confirmed what my gut had told me so loud and clear that afternoon in Arizona. Big glass and tripods are not only for Coues deer. Both of those hunts resulted in trophy animals being taken before noon on opening day after we had spotted them early with a Big Eyes setup. By now, I do not expect you to be surprised to learn that both Major Painter and I own good 15x glass and tripods. From my observations, the majority of hunters who venture into these waters follow the same pattern that Major Painter and I did, initially dismissing the utility and applicability of Big Eyes to their own hunting. The optics are too big, the tripods are too heavy, and "I already own 10x Leiczeiskis." Then they try them, and all doubts evaporate. Once you try Big Eyes on a tripod, you will know what I mean. Heavy? Yes. Bulky? You bet! But optics and tripods go together like ketchup and freedom fries, john boats and Labradors, or poker chips and sunglasses. Individually, they are good. Together, they are both better. Get used to Big Eyes. My bet is that you will be seeing them more and more in the wide-open West. For me, I can tell you that a good set of Big Eyes will be in my kit for the rest of my hunting career. I hope that this new awareness is a sign that Mother Nature is crediting me in smarts what she is debiting me in youth. For those of you who may wish to investigate further, we have run a product test to answer some of the many questions that I and others have had when we first encountered the Big Eyes phenomenon. The focus of this head-to-head comparison is to evaluate ?in normal field use ?the current Big Eyes "players" from the top makers and to present the complete, unbiased results to the 24hourcampfire.com and Smokelore readers. 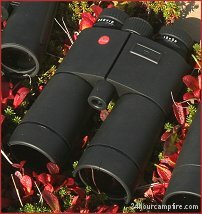 A panel of 24hourcampfire.com members carefully evaluated the newest high magnification binoculars from the top makers. The panel included men and women, novices and old salts, and they evaluated the Big Eyes in clear daylight, under heavy cloud cover, and in twilight, for a week on Kodiak Island, Alaska. Additional testing on selected models was conducted in several other locations, including Arizona, California, New Mexico, and Montana. Each reviewer received a detailed score sheet, unlimited time with the binoculars, and instructions to evaluate methodically each and every criterion for each binocular and rate each on a scale of one to ten. What we found is what we will report. No more. No less. A few of the binoculars were recent retail purchases. Most of the others were temporary loans from their manufacturers. None of the manufacturers remunerate 24hourcampfire.com in any way. We are beholden to no one. And by the time you read this, all the loan binoculars have been returned to their manufacturers. The original Big Eyes, the head of the class here for years was the Zeiss 15x60 B/GA, a hardy porro-prism design that spanned thirty-plus years. Discontinued since the late 1990s, a good Zeiss 15x still commands a hefty sum as cognoscenti round them up for their excellent optics and 60mm objective lenses. Good luck finding one at a decent price! In spite of the dearth of contenders for the throne vacated by the big Zeiss in this category, the quality of the relatively few offerings in today's market, as well as the remarkable variety of unique designs, encouraged the reviewers. Although more choices are always good, there is something for everyone in Big Eyes land. In this category, the panel evaluated the Swarovski 15x56 SLCnew, the Leica 15x56 Geovid (with integral rangefinder), the Leica 10+15x56 Duovid, the Minox BD 15x58 ED BR, the Minox BD 10-15x40 BR, and the Zeiss Conquest 15x45. The only pure 15x60-class produced by one of the "Big Three" is the Swarovski 15x56 SLCnew. It earned best-in-class honors for pure optical performance. Testers' comments included "brightest of the bunch," "zero eye strain," and "great once adjusted." Color fidelity was rated as best overall, as were resolution and edge-to-edge sharpness. In short, image quality was superb. Despite the accolades, two evaluators found the interpupillary-distance adjustment challenging. One reviewer, who could not get a satisfactory "fit" with the Swarovski, said "Binocular is unusable due to interpupillary adjustment," and another reviewer opted to buy (at retail) a different brand for the same reason. Another reviewer noted that the eye cups really had only two positions, fully extended and fully contracted, because the eye cup extension shifted too easily for any "in between" use. Fixed intermediate steps would be welcome. More than one evaluator recommended a graduated (instead of click-stop) adjustment for the most precise of diopter adjustments, although we were able to achieve very sharp images with no inadvertent shifting of the diopter setting while we were operating the focus wheel. Beyond the superlative image, reviewers wrote positively about "simple design," "clean lines," "straightforward operation," and "well balanced in the hand." Reviewers agreed that the Swarovski SLCnew ?neither the lightest nor the heaviest, neither the biggest nor the smallest ?is a refined, ergonomic design that delivers on its lofty promise of optical performance in a package with few flaws. The best pure performer. Suggested retail price: $1,899. If the Leica Geovid 15x56 BRF is the future of Big Eyes binoculars, then the future is very bright indeed. At a relatively svelte 45.85 ounces including batteries, the 15x56 Geovid weighs 6.7 ounces less than the excellent Minox BD 15x58 ED BR (52.55 ounces), and with a 1200-yard laser rangefinder built in, is within half an ounce of the Swarovski 15x56 SLCnew! In an adroit melding of highly useful technology, the Geovid allows the Big Eyes hunter to save the weight of an added rangefinder (a Leica Rangemaster CRF 1200 weighs half a pound with a battery) and add the convenience and efficiency of single-unit operation on distant targets. Ranging becomes a natural, sequential part of long-distance glassing, and is done with the benefit of a tripod. Big Eyes symbiosis defined! 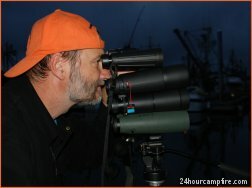 Reviewers noted a different hue to the Geovid's image than other binoculars, a subtle bluish tint that caused some concern as to how it might affect twilight brightness. However, waning light established the Geovid as a top-notch performer (if a hair below Leica's superb Ultravid line) with resolution generally on par with the best performers in this class. Except for a wee deduction for color fidelity and a slightly darker image at the most extreme twilight, the Geovid performed admirably in terms of image quality. The only true negative that reviewers noted was the lack of a center-hinge attachment for a tripod adapter, but that is a characteristic of all Leica binoculars. Instead, Leica's generic tripod adapter is a strap-over system that reviewers found less steady and limiting in terms of binocular positioning and interpupillary adjustment. We would like to see an upgrade here. Some reviewers paled a bit at the $2,495 price tag. The five-year warranty (as opposed to lifetime warranty), is also a bit disconcerting. However, lifetime warranties on electronics are rare indeed, and the truth is that in five years, rangefinding technology will surely have risen to new and better levels of performance. No matter, the Leica Geovid 15x56 is simply too utile, too intelligent ?and delivers too much performance to hunters now ?to worry now about what the next generation of Geovids will offer. The cutting edge of technology, well delivered. The Geovid does it all. MSRP: $2,495. First impressions can mean a lot, and with the Minox 15x58 ED BR, what you see is what you get. What you do not see is the price, and because of its MSRP of $1,050, reviewers unanimously voted the Minox as the "Best Value." The largest (225x159x69mm) 15x that we tested, as well as the heaviest (52.55 ounces), it was ?as the reviewers noted ? "very heavy for a small hand," "bigger and heavier than the Geovids," and "massive glass." 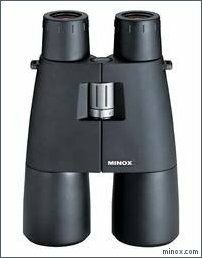 Despite its weight and bulk, reviewers were very impressed with the Minox's optical performance: "Very, very close optically to the Swaro and Leica," "98% as good as binos costing twice as much," and "incredible optics, at any price." When Minox introduced the revamped 15x58 ED at the 2006 SHOT Show, the big news was the ED flouride glass, which, according to Minox, aids in accurate color rendition. Compared to the earlier versions of the Minox 15x58 without the ED glass, the new ED BR is a noticeable improvement, not only in color fidelity, but in sharpness and resolution as well. Reviewers noted that the Minox stayed with the Leica and the Swarovski into the far edges of twilight, with image quality constant well past legal shooting light. Resolution was excellent, if a fine hair less sharp than the very best. Clarity and brightness were also excellent, partly because of the 58mm objective lenses, the largest of any 15x binocular that we tested. Reviewers noted "no eye strain,?“easy to get properly adjusted," and "great tripod adapter." A few reviewers noted that it "does not adapt well to bifocals," that its "objective covers felt cheap,?“the Swarovski-type tethered covers are much nicer," and "very big ocular housing, tricky to fit in eye socket." However, these observations did not detract from the overall impression that the Minox 15x58 is truly a lot of glass for a great price. Runaway best "bang for buck." MSRP: $1,049. In another innovative design by Leica (we would sure like to see a straight 15x60 from Leica! ), the Duovid combines the flexibility, light transmission, field of view, and hand-held compatibility of 10x glass with the high magnification and reach of 15x, instantly. The Duovid truly is two binoculars in one! Reviewers commented that it was "Very handy," "neat and useful," and "really two binoculars." As it was hampered to some degree by a relatively small 3.3mm exit pupil at 15x (because of the 50mm objective lens), the Duovid was not quite as bright as other full-sized binoculars were, particularly the Swarovski 15x56 and the Minox 15x58, in light that was less than ideal. Resolution remained surprisingly sharp under overcast skies and even into the earliest stages of twilight, but as the light got critical, the competitors?full-sized 15x remained unquestionably brighter and their resolution sharper. For this reason, the Duovid remains a compromise as a Big Eyes. In fact, a look at Leica's web site indicates that Leica intended the Duovid as a combination of binocular and spotting scope, (a notion that we don’t agree with ?see the sidebar), describing the Duovid's use primarily as a 10x, with shifts to 15x as needed for closer viewing. Still, the Duovid performed very well overall, and for hunters who would prefer not to carry two binoculars (as many Big Eyes hunters currently do), or for those who hunt varied terrain, the Duovid certainly provides legitimate Big Eyes performance well into twilight, as well as truly superb 10x performance at a very economical 44 ounces, allowing hunters to save overall weight and bulk in an eminently versatile kit. As with the rest of Leica’s binoculars, we would prefer to see a better tripod adapter, but otherwise, the Duovid 10+15x50 is a binocular (or two binoculars) that delivers to the very edge of its design limitations. Although it is not optimal for exclusive Big Eyes hunting, the Leica Duovid brings a lot to the table and allows the one-binocular hunter into the Big Eyes game with no great sacrifice in performance ?at a steep price. The Zeiss 15x45 Conquest ?at first intriguing for its relatively compact size and weight ?fell squarely into the category of "too good to be true" and was ultimately disappointing as a Big Eyes during crunch time. Sized like a conventional full-sized binocular, the Conquest generated enthusiastic initial comments like "feels like a regular binocular," "very lightweight," and "this is a 15x?" Its image quality, while not quite on a par with Zeiss's Victory FL T* line, was nevertheless crisp, sharp, and well resolved in broad daylight. Initial impressions were favorable. However, as the light deteriorated, the optical compromise necessary to make the Conquest's compact size possible, the 3mm exit pupils generated by its relatively small 45mm objective lenses, turned out to be its undoing as a true Big Eyes contender. Under an overcast sky, the degradation of its brightness and resolution was plainly noticeable to all reviewers, especially when it was stacked against full-sized 15x binoculars. "Resolution not so good now" and "not very bright" were among the comments that it generated. As cloud cover faded to twilight, the Conquest became unusable well before the competitors did, and most disturbingly, still within legal shooting time. Reviewers noted its "relatively poor twilight performance," "outclassed by the big 15x," and "this is not hunting glass." In addition, though the relatively compact size and weight encouraged hand-held glassing, the Conquest's magnification nullified these advantages. "15x is still 15x ?I need a tripod," one reviewer said. In the end, and perhaps in an unfair comparison, the Zeiss Conquest 15x45 is simply not well suited as a Big Eyes hunting binocular. 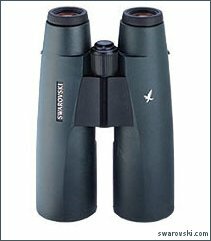 While birders may appreciate the compact size and weight combined with superior optics and 15x in daylight, hunters looking to find game during twilight are better off with a traditional 10x40 or 15x60 that offers better twilight performance. Fish out of water. MSRP: $829.95. 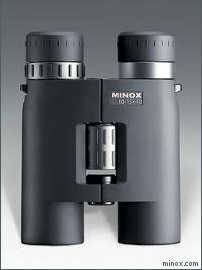 Another example that 15x does not necessarily a Big Eyes make, the Minox BD 10-15x40 BR "Vario" is probably better suited to the hunter who uses primarily 10x glass with occasional shifts to higher magnification than to a Big Eyes hunter who requires constant 15x performance. Although it is notable for its true "variable" performance ?meaning that the user can select any power between 10x and 15x (as opposed to the Leica Duovid's 10x or 15x design) ?reviewers noted that this Minox suffers from an unusual "tunnel view" that some reviewers found distracting and tiring. "Weird glass," "novel, but funky," and "I'm not sure I like this" were among their comments. However, one reviewer noted "at 34 ounces and regular sized, I have 10x and can zoom higher when I need it. I like the size and options, and the price." Indeed, the reviewers were favorably impressed with the Vario's $769 MSRP ? "I don't know how Minox does it," "definitely worth the money," and "so much less expensive than the Leica Duovid." As a Big Eyes, however, the Vario simply was out of its league. The 40mm objective lens rendered a paltry 2.67mm exit pupil, which reviewers concluded was simply inadequate in any but the most favorable light. "Tough to make out detail," "below average, even off the tripod," and "not as good as the Zeiss Conquest" were some comments. A tough sell for a tough crowd, perhaps the Minox Vario would do better in a 10x comparison, where its price and versatility would earn it a higher score. In company with true Big Eyes, the Vario simply did not have the horses to compete with the Big Boys at 15x. Another fish out of water. MSRP: $769. A smattering of 12x binoculars made the journey to Kodiak Island to lay claim to Big Eyes contention, and even though the sample was relatively small, the design limitations of 12x50 glass became evident as the panel compared them to the larger 15x. Generally smaller, lighter, a bit brighter, and with increased field of view and 4mm-plus exit pupil diameters, the 12x were expected to nudge the 15x in pure resolution and compete until the end in twilight performance. However, when resolving distant detail in dimming light, even the mighty Leica Ultravid was undone by the better-grade 15x, supporting the proposition that with the quality of lens coatings being similar, twilight factor is a good indicator of a binocular’s ability to resolve detail in low light. 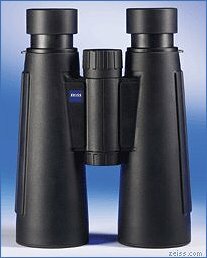 Admittedly, if the testing criteria had been something other than long-range Big Eyes performance, results might have been different, especially with the excellent Leica Ultravid, but in terms of glassing big country with a tripod-mounted binocular, testers agreed that 15x60-class glass remains superior. The Leica 12x50 Ultravid, truly a world-class binocular, was the only glass that could run neck-and-neck with the Swarovski 15x56 SLCnew for best-in-show honors. It noticeably outperformed the Geovid and the Duovid, among others. Smaller, lighter (36 ounces), and with a larger field of view than the 15x, it impressed some reviewers as the brightest glass on the boat. Similarly, some reviewers found the Ultravid's color fidelity the truest. Almost all agreed that the flatness of its field and its edge-to-edge resolution were tops. One reviewer noted that "they (Ultravid and SLCnew) both look very sharp, but with a slightly different color bias." Another said that "this one and the Swarovski are indistinguishable." It was not until the light dimmed and distances got long that the Ultravid showed any weakness as a Big Eyes. "The farther I look, the more I like the 15x (Swarovski)," said one reviewer. "I see less detail at long range with the Ultravid," said another. "The extra magnification makes a lot of difference," said a third. While the Ultravid is unquestionably an elite binocular that performs optically to the very limits of its design, some reviewers felt that it fell a bit short as a Big Eyes, requiring a tripod, yet lacking in magnification and objective diameter for low-light and long-distance work. "At 12x, I'll still need a tripod," said one. "The close-focus numbers tell me this is awesome birding glass," said another. "Neither fish, nor fowl as a Big Eyes," said a third. This glass left one reviewer torn. "It's so good until you get way out there ... does Leica make a 15?" Stellar optically and mechanically but not optimized for Big Eyes work. MSRP: $2,145. 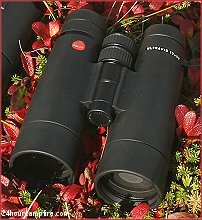 If a binocular's twilight factor accurately indicates its ability to resolve detail when the light is waning (when the quality of its lens coatings is high), the Nikon 12x56 shows that when lens coatings are not as good as they could be, optical rules of thumb can be less reliable indicators of a binocular's resolving power and brightness. By any optical rule of thumb, the Nikon's 4.7mm exit pupil and 25.92 twilight factor, made possible by its large 56mm objective lens, should have given it a strong advantage over the Leica Ultravid 12x50. Instead, the Nikon corroborated the familiar caveat that you get what you pay for. In this case, that is not necessarily a bad thing. At a list price of $429, the Nikon also illustrates just how competitive Pacific Rim optics can be with the Big Boys from Europe. "Good, flat field, but I was expecting brighter glass," said one reviewer. "It's good, but not in the same league (with Leica)," said another. "Image quality stays constant as light conditions deteriorate," opined a third. Evaluators wrote positively about "nice ergonomics," "I like the camo housing," and "overall, a nice package." Moreover, when told the Monarch's list price, reviewers liked its value: "No doubt, it's worth the price," "a long ways from Leica money," and "I'd buy this bino in 15x." As a Big Eyes, the Monarch suffered from the same deficiency as the other 12x ?a lack of magnification that affected its ability to resolve detail at long range ?and reminded evaluators of the massive Minox 15x58 in dimensions and design but without the same optical pop. 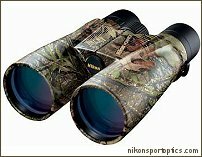 Still, at this price level, all agreed that we would like to see this Nikon glass in 15x. Good glass, great price, underpowered as a Big Eyes. MSRP: $429. 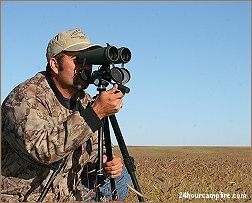 The Pentax 12.5x50 binocular proved to be a worthy alternative to hunters who are looking for the size and magnification of the Leica Ultravid 12x50 without having to spend the big bucks for the Leica. 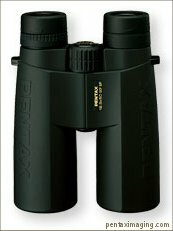 The Pentax DCF SP is a well designed, ergonomic package, with a full 4mm exit pupil, in a light magnesium housing with an overall weight of just 30 ounces. Aspherical lenses, "hydrophobic" exterior lens coatings, four-stop eyepieces, lockable diopter adjustment, and phase-coated roof prisms round out an optical package that incorporates the most recent advances in optics technology at an affordable price. Testers noted "generally good optics," "nice, light glass," and "excellent in good light." Like other 12x glass, in comparison with Big Eyes, the Pentax's relatively low magnification and relatively small objective lenses noticeably handicapped its performance at extended distances and in less than optimum light. The Pentax is a nice upgrade for hunters who want to move up from 10x without breaking the bank, but a Big Eyes it is not. Nevertheless, at a list price of $669, the Pentax is less than a third as costly as the lofty Leicas ?and like the Nikon 12x, it delivers a lot of optical power for the price. Good optics, nice value, but not really a Big Eyes. MSRP: $669.